Sprinkle salt over zucchini and let them sit for about 30 minutes. Drain well (squeezing between hands). Add egg, cheese, garlic, parsley and bread crumbs to the zucchini. Mix and combine the ingredients. If the mixture is not sufficiently compact, add more bread crumbs. Shape small patties, gently cover with bread crumbs and place in a baking pan lined with the parchment paper. Bake in the oven at 200°C for about 30 minutes until golden and done. Meanwhile, divide cauliflower into small florets; add water and cook in the oven proof dish in the microwave for 20 minutes at max or until cauliflower is tender. With slotted spoon transfer the cooked cauliflower into the blender, and the cooking water into another pot. In this water cook millet over medium heat for 10 minutes or until soft. Add the millet to the cauliflower and blend into puree. If too thick, add a little water. Puree should be fluffy and light. Sauté gently onion and garlic for 1 minute in olive oil and butter, add cauliflower and millet mash, mix and combine and fry for a short time. 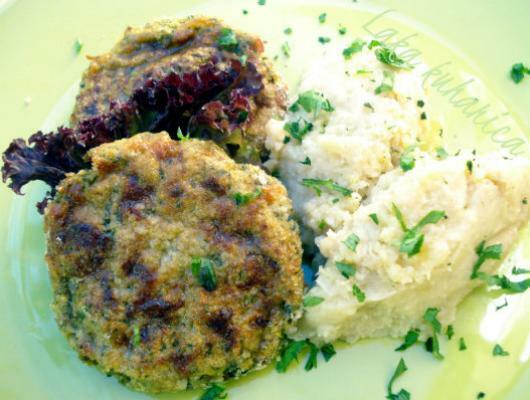 Serve patties with the mash, sauce ( if desired) and green salad. Easy suggestion: cauliflower and millet mash is a great side dish to various meats.